Credit rating agency Standard & Poors released its annual review of Venezuela state oil company PDVSA. Mostly it’s pretty uncontroversial. But they are remarkably optimistic about Venezuelan oil production in 2013. During 2011, PDVSA’s crude oil production averaged 2.991 mbpd, up 1% from 2.975 mbpd in 2010… The company’s financial performance and main credit metrics were strong in 2011 with an EBITDA margin of 40%, mainly due to higher oil prices… Assuming our price deck for oil and gas at $80 for 2013, and production levels of about 3.4 mbpd, we believe that these ratios should remain within the current range. This entry was posted in Uncategorized on July 30, 2012 by Steven Bodzin. 1. Put computer speaker near kitchen. This entry was posted in Uncategorized and tagged lithium, recommendations on July 29, 2012 by Steven Bodzin. You’d almost think that the FARC has decided, aww, screw it — we’re never going to topple capitalism, but by George, we can keep Colombia below a million barrels a day! Output has now been basically flat for a year. Update, now that this screen isn’t being used to watch The Wall — I mean, the opening ceremonies of the 2012 Olympics: here’s the year-over-year chart of oil output and gas sales. Click for full size. 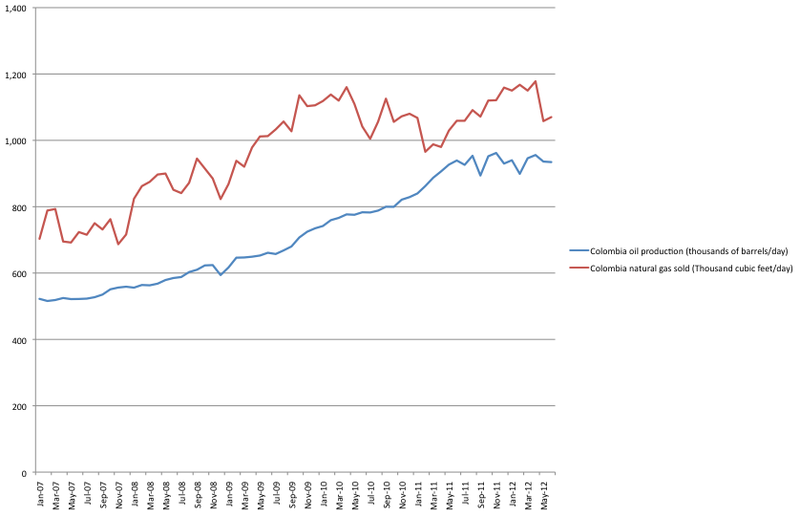 You’ll see that this month’s numbers show Colombia’s first year-on-year oil output decline since, well, since this spreadsheet started in 2007, anyway. A long frickin time. Obviously the FARC are trying to fark up investments, especially in oil. It looks to me like they are pushing against a river. This entry was posted in Uncategorized and tagged colombia, oil, stats, terror on July 27, 2012 by Steven Bodzin. I realize these complex financial frauds aren’t for everyone, and this report is pretty technical. But what’s fascinating here is seeing how many people who never come near oil try to stick their fingers in the money stream that normally flows back up an oil pipeline. This entry was posted in Uncategorized and tagged illarramendi, pdvsa, recommendations, venezuela on July 26, 2012 by Steven Bodzin. Hi, this is a note to anyone out there who might want to send me a fax, since I know that a few people have asked for a fax number recently. Please use the number +1 (347) 201-3790. That is all. This entry was posted in Uncategorized and tagged housekeeping on July 25, 2012 by Steven Bodzin. Just how well does Venezuela get on with Chevron? Very. A couple days ago, Raúl Gallegos published a decent little column about how Chevron is, if not betting on a Hugo Chávez reelection, at least setting itself up for a long, happy relationship with the Bolivarian Republic. Chevron has no illusions about how Venezuela works. It first set up shop there in the 1920s, when strongmen showed heavier hands than Chavez. Scores of populist governments and two oil-industry nationalizations later Chevron is still pumping crude. And when PDVSA asked for a couple of billion to invest in Boscan, a jointly-run field Chevron first came across in the 1940s, the oil major obliged. The 13-year loan is costing PDVSA Libor plus 4.5 percent, far less than the 11 percent that its 2027 bonds pay. I quibble with a bit of the column, but basically, he’s right. Chevron in Venezuela is now too big to nationalize. I had thought Repsol fell into the same category. But maybe not. Check out this article from last night. Venezuela President Hugo Chavez warned Repsol SA (REP) to “think carefully” about taking action against Argentina after it nationalized its YPF SA (YPFD) unit, indicating the Spanish company may face ramifications in Venezuela. What jumps out here is that Chávez has never made any similar threats against Chevron over its $18 billion debt to ostensible ally Ecuador. If you haven’t followed that whole story, here’s an article, the plaintiff’s version and the company’s version, but long story short, Chevron was sued in the US for polluting Ecuador. It got the case moved to Ecuador, apparently thinking courts there would be friendlier. Courts there ruled against the company and ordered a huge amount of compensation. Chevron insists that the rulings were flawed by corruption, though I think it’s fair to ask, if they were worried about corruption, why did they get the case moved to Ecuador? The whole thing is a mess. If Chávez were ideological, you’d think that the anti-Chevron campaigners would find open ears in Venezuela, and would even now be auctioning off the Boscan oilfield to pay the Ecuador debts. Instead, I don’t think Chávez has ever mentioned the case. And Chevron is piling in ever more billions of dollars. Those of you who think politics has anything to do with ideas might be surprised by this. Please learn. This entry was posted in Uncategorized and tagged argentina, chevron, cvx, ecuador, politics, rep, repsol, venezuela on July 24, 2012 by Steven Bodzin. Francisco Javier González is president of fake oil company Arevenca and owner of failed airline Fly Aruba. Yesterday, González was stopped at the Queen Beatrix Airport in Aruba as he tried to go through customs to get on a general aviation plane, BoletinExtra reports. I am aware of at least three people who claim to have lost more than $100,000 to Arevenca, with a total loss of about $20 million. But as long as Arevenca took money from the rich, González was able to go from country to country without too much trouble. Most victims never come forward, for fear of being labeled as suckers. But when he recruited workers away from stable jobs and then failed to pay them — apparently, that is the kind of thing that gets you in trouble. This entry was posted in Uncategorized and tagged arevenca, aruba on July 22, 2012 by Steven Bodzin.